See more objects with the tag personal, communication, music, minimalism, neutral colors, compact, innovative. See more objects with the color lightgrey grey dimgrey darkslategrey or see all the colors for this object. This is a Portable radio. It was manufactured by Sony Corporation. It is dated 1960 and we acquired it in 2012. Its medium is molded plastic, stamped metal, stamped and pierced sheet metal, cord. It is a part of the Product Design and Decorative Arts department. The TR-620 radio helped Sony to achieve international acclaim. 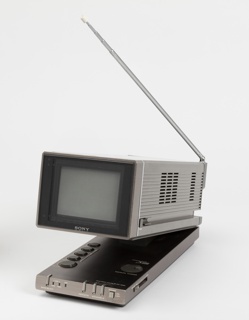 Over time, Sony miniaturized and simplified its radio designs, offering them in fewer case colors and with less decoration. 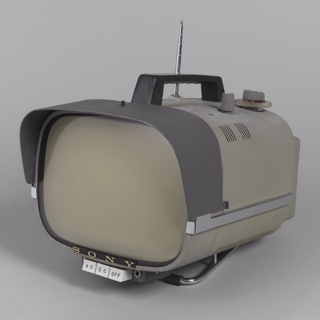 The TR-620 (1960) is an example of a step in Sony’s design evolution. The TR-55 (1955) was the first of Sony’s transistor radios and its first export. The predecessor to the TR-620, the TR-610 (1958), was the first radio to include the now-ubiquitous Sony logo typeface; with its simple rectangular design of about 4 x 2½ x 1 inches, it was the smallest and lightest AM radio of its day. Sony sold half a million TR-610 sets worldwide between 1958 and 1960. 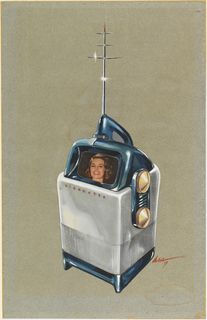 The TR-620 was smaller yet. 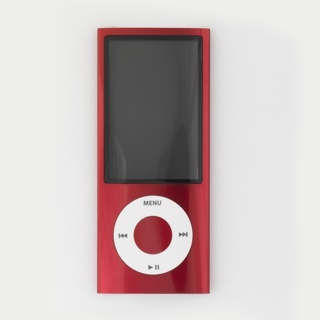 Easily able to fit into a purse or pocket, it appealed to the burgeoning demand for increasingly diminutive and portable personal electronics. It also had a slightly larger station read-out than the TR-610. Its rectangular form was dominated by a gold-toned pierced circular metal speaker with a simple, recessed, asterisk-like design. The radio came with an earphone and black faux leather case, and was available in several colors, including white, blue, and red. 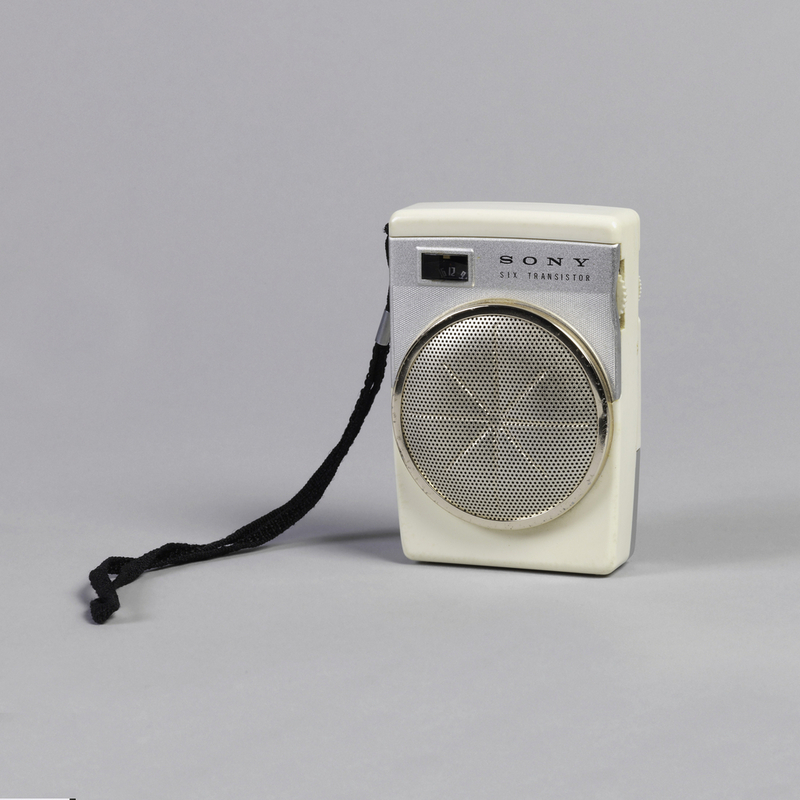 The TR-620 was Sony’s last transistor radio with a speaker marketed as a shirt-pocket radio. By the mid-1960s, Sony engineers further reduced the radio’s size by eliminating the speaker to create an earphone-only radio, which also allowed for the use of cheaper transistors. This TR-620 is being offered as a gift by its original owner, along with its original packaging and accessories. It was purchased new around 1960. It is in excellent condition and would broaden the museum’s collection of radios. At the time of proposed acquisition, the majority of the radios in the collection are table models (1930s–50s) and portable radios (late 1960s–90s). The TR-620 also relates to media players and other miniature electronics held by the museum.